Advocates for the homeless say that while serious, the incidents represent a minute fraction of similar crimes committed in the region, and that homeless people are more likely to be the victims of violent crime than perpetrate it. Tensions over Seattle’s handling of the homelessness crisis were roiled again last week, as authorities on Wednesday charged a 26-year-old homeless man in connection with an alleged attack near the Cinerama movie theater downtown. David Ailep Jr., who told authorities he’s homeless, now faces three counts of felony assault and theft after he allegedly accosted a woman passing him on the street, then struck her father in the head when he attempted to intervene. The Seattle Times’ Project Homeless is funded by BECU, The Bill & Melinda Gates Foundation, Campion Foundation, the Paul G. Allen Family Foundation, Raikes Foundation, Schultz Family Foundation, Seattle Foundation, Seattle Mariners, Starbucks and the University of Washington. The Seattle Times maintains editorial control over Project Homeless content. The incident near the theater is the third high-profile incident involving a homeless suspect to capture the city’s attention, further inflaming criticism of City Hall’s approach to managing the unauthorized tent encampments that have become a common feature of downtown Seattle and beyond. Michael Person, 47, was charged earlier this month with misdemeanor assault after he allegedly attacked a tourist from Arizona as the man and his family walked by his tent to the Space Needle. Person later entered a plea of not guilty. Over eight years, the government has deported about 34,000 people via Boeing Field. King County wants it stopped. 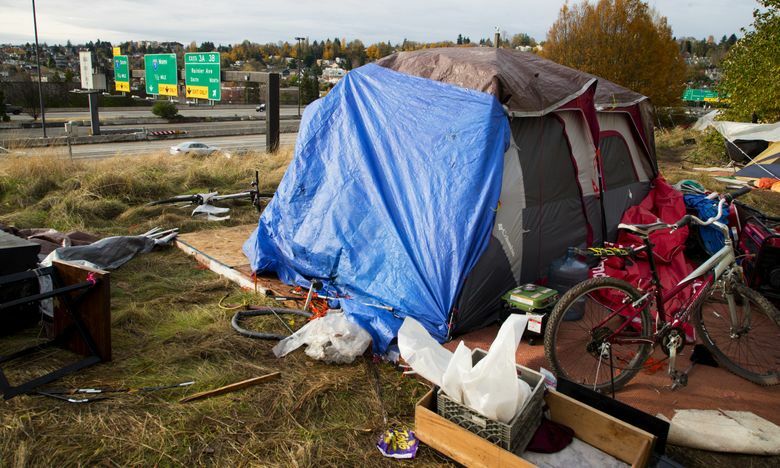 In May, county prosecutors accused Christopher Teel, a 24-year-old former resident of Ballard Nickelsville, one of the city’s seven sanctioned homeless encampments, with sexually assaulting a woman in the temporary bathroom of a nearby auto-dealership. Advocates for the homeless say that while serious, these incidents represent a minute fraction of similar crimes committed in the region, and that homeless people are more likely to be the victims of violent crime than perpetrate it. But they come after a raucous month of debate about the city’s declared state of emergency on homelessness. The Seattle City Council, in a stunning reversal, repealed a tax on large employers to fund homeless services in the face of a business-backed signature campaign to kill it. Homelessness placed third in a list of issues mentioned most by Seattle residents in a Seattle Police Department survey released last week. Property crime and car prowls were among the top five specific public-safety concerns identified by residents. Seattle’s property-crime rate remains one of the highest in the country, though the numbers have fallen across the city in recent years. Concerns about the effect street homelessness has had on tourism have also returned, though data suggests visits to the city have not been affected. According to Visit Seattle, Seattle and King County’s tourism marketing organization, about 39.9 million people visited Seattle and King County in 2017 — a 2.6 percent increase from the previous year. David Blandford, senior vice president of Visit Seattle, said conventioneers have expressed serious concern, but none have actually canceled a booking over issues related to homelessness. Similarly, the number of cruise-ship passengers entering Seattle reached an all-time high of about 500,000 people last year. Port of Seattle spokesman Peter McGraw said the port has not heard of “bad interactions” between passengers and people who are homeless. But Jordan Royer, vice president of Pacific Merchant Shipping Association, which supported the referendum to repeal the city’s short-lived tax on high-grossing businesses, said a lack of enforcement is driving frustration among city residents. Lisa Daugaard, director of the Public Defender Association, agrees that enforcement is critical to addressing the legitimate concerns about public health and safety tied to people living on the streets. But to see real reductions in the problems associated with homelessness, enforcement has to be coupled with robust outreach to connect people to mental-health, drug-treatment and other services, she said. “It makes sense that people would reach for the enforcement option when they see things aren’t working, but it’s not an either or proposition” Daugaard said. Vernal Coleman: 206-464-3304 or vcoleman@seattletimes.com; on Twitter @vernalcoleman.